My daughter sent this article and I am going to give it a try. Sounds really good and there would be endless possibilities for using it in various recipes. Vinegar can be made out of wine, beer, cider or, in this case, dark rum. This is a simpler formula than most (from "Ideas in Food," by Aki Kamozawa and H. Alexander Talbot) with no yeasty "mother" or molds to deal with. A dose of sugar (such as maple syrup, which lends a haunting sweetness here) helps the process along: it is converted into alcohol, which then ferments into the softer acetic acid. The result is like balsamic vinegar but rounder and more syrupy. Start with 3 1/3 cups live vinegar, which contains living yeast; look for the words "unfiltered" or "organic" on a label, or get your hands on some homemade vinegar. Pour this into a large glass or plastic container with a loose-fitting lid. 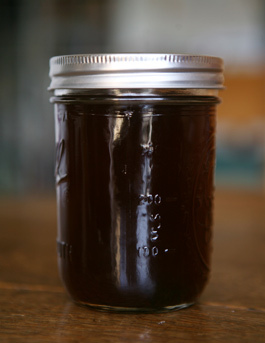 Mix in 3 cups maple syrup; 1 1/3 cups dark rum and 7/8 cup water. Cover the opening with cheesecloth to keep out dust and allow for airflow so that wild yeasts can find their way in. Place the lid gently on top and store in a cool, dark place for 4 weeks. When it tastes smooth, tart and sweet, with no alcohol burn (this might be in 4 weeks, or it may need more time), the vinegar is ready. Strain it into smaller containers and store at cool room temperature, or in the refrigerator. In addition to vinegar's usual uses, this is lovely drizzled on ripe cheese or dropped into a martini. New Research--Great news for maple syrup lovers! Health Benefits of Maple Syrup!